Because they are soft, mushrooms are very easy to chop. All you need to a good non-slip chopping board (plastic or wood) and a sharp knife. That last one is really important. A blunt knife is going to mash down the soft mushroom rather than cutting cleanly through it. Like any other foods such as onions or iceberg lettuce, there are many ways to chop a mushroom depending on your personal preferences and the specific recipe you are following. Here are some tips for cleaning and prepping mushrooms at home. It is second nature (and perhaps a result of evolutionary self-preservation) to wash anything you are prepping under tap water to get rid of harmful bugs. But go easy on mushrooms. In fact, don’t let them touch water at all. Mushrooms absorb fluids easily. So if you wash it under the tap or even wipe it with a moist towel, it’s going to take in water and turn soggy when you cook it. Store-bought mushrooms are already fairly clean. Just dry-brush them with a paper towel or soft bristle brush to get the last bit of dirt out. To make the mushrooms easier to chop, remove the stems first. There are two equally easy ways to do it. The simplest is to chop off the bottom part of the stem – the part that is sticking out of the mushroom. This will leave a bit of the stem inside. If you want to completely remove the stem, break it off. Hold the mushroom in one hand and use the other to push the mushroom firmly towards one side till it breaks. Then push it in the opposite side until that side breaks. Twist it a bit until it completely breaks on the inside then pull it out. It should leave a clean hole in the mushroom. Note: The mushrooms stems are totally edible but not everyone likes their texture. It’s up to you whether to throw them out or keep them. The easiest way to prep mushrooms is to cut them into halves or quarters depending on how you like to enjoy them or what the recipe calls for. To half them, just place the mushroom on a chopping board and slice cleanly through the centre. To quarter them, place the two halves on the cut side and halve them to get four quarters. 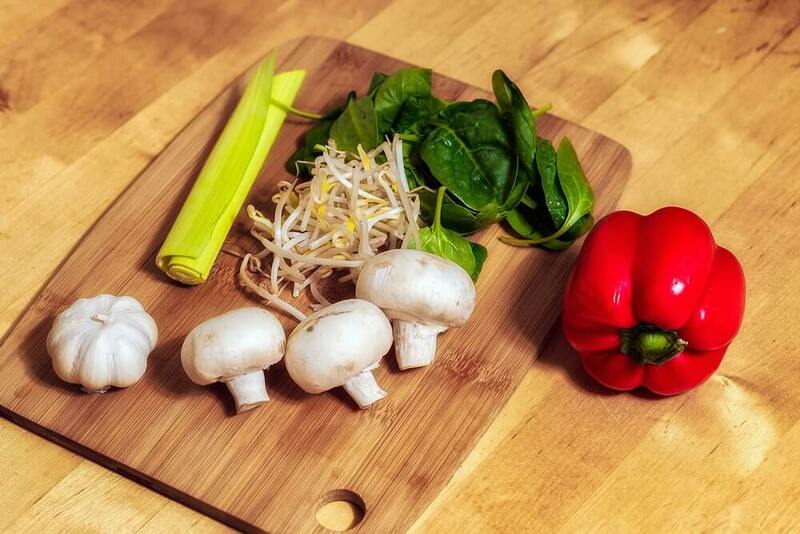 To slice a mushroom, put it on the chopping board and hold it firmly with your fingers. Your index finger should be closest to the edge of the mushroom. Fold it backwards slightly such that the knuckle sticks forwards a little. You want the flat part of the knife to brush against your knuckle as you slice. The knuckle acts as a guide, allowing you to slice quickly without cutting yourself. Reminder: please use a sharp knife. A quick honing using a sharpening steel or electric knife sharpener is enough. Start slicing from one end of the mushroom. How far back you move your index finger as you cut determines how thick the slices will be. For thin slices, move your finger very slightly with each slice. For thicker slices, move it further back. Here’s a quick video showing how to cut and slice a mushroom. If a recipe calls for diced mushrooms, here’s how to prep the mushroom. Hold the mushroom in the board with your fingers holding it firmly from two sides. Using a sharp knife, make two vertical cuts through mushroom such that it is split into three slices. Don’t separate the pieces. Carefully turn the mushroom such that the vertical cuts are now horizontal cuts (the 3 slices should be stacked on each other). Then make two other vertical cuts through the original slices. This will create thin mushroom fingers. Don’t worry if they fall apart. Just bunch them together with your fingers and slice across them several times to create diced pieces. Here’s a quick video showing the whole process.